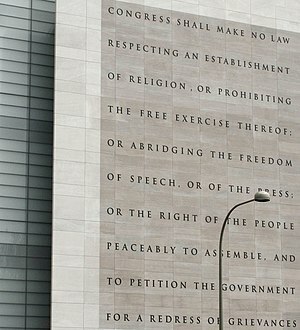 It never ceases to amaze me how eloquent, prescient and radical the founding fathers of our country were when they crafted the First Amendment to the U.S. Constitution 222 years ago. In barely enough characters to fill two tweets, the first (and arguably most important) amendment covers our most cherished freedoms: religion, speech, press and assembly to air grievances against the government. Wow, think about the freedoms we enjoy — no, take for granted — when you look at what’s happening Egypt, Bahrain, Yemen, Tunisia, Iran and other places in the world today. Wisdom and enduring relevance more than two centuries later. One wonders if today’s Congress could be as wise. Thank you, Nancie. That means a lot to me, coming from you.